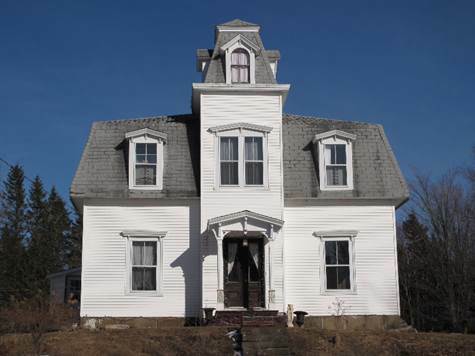 Dorchester, NB - Gorgeous second empire style century historic home sits on a private treed lot on 4.5 acres! Owned by the Palmer Family (family of ship builders). This home boasts quality craftsmanship and details woodwork throughout. Slate fireplace, hardwood & softwood flooring, walk-up attic and unique widow’s walk with picture perfect views! In-law suite off kitchen with separate bathroom and kitchen, great for guests! Large kitchen & elegant foyer with glass on the stately doors, beautiful staircase leading to 2nd floor with 5 bedrooms all with closets. This bright & charming home also has vinyl siding, storm windows and some thermal windows, roof shingles approx 10 years old, new 120,000 BTU wood furnace 2008, detached wired workshop, storage shed. New oil tank 2010. Great B & B potential or for hobby enthusiasts! Only 10 minutes from Sackville and 30 minutes to Moncton.